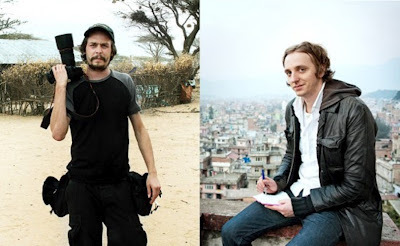 September 13, 2012 — Following the release of Swedish journalist's Johan Persson and Martin Schibbye, SVT, a Stokholm-based TV channel and news agency, released a video containing evidence the Government of Ethiopia staged the clip that was used to incriminate the correspondents. The unedited version of the video, which was provided to SVT by a source named Abdullah Hussein, shows men next to the two Swedes that were said to represent the ONLF by Addis Ababa, that are seen joking with men representing government troops in between scenes. The source disclosed to SVT the video was created two days after the Swedes were captured in the Ogaden region of Ethiopia, where they had entered the country to document the numerous human rights abuses by the government. After the staged drama had been completed, the Swedes were transported to the capital, Addis Ababa, where they met with embassy officials and obtained medical treatment for the wounds they sustained, Hussein said. The journalists were originally sentenced to 11 years in prison but were released as part of a pardon on Ethiopian New Years. Sources say Swedish officials were informed of their September 11 release date as early as last May, after the Nordic country threatened to withhold aid.